FILE - A man sits on a promotional gimmick in the form of missile and the U.S. flag outside a U.S. apparel shop at a shopping mall in Beijing, July 5, 2018. As the United States ratchets up trade threats, China suffered a setback on Monday for its calls for international cooperation in counteracting what it calls U.S. President Donald Trump’s protectionist policies. Luca Jahier, the president of the European Economic and Social Committee, said that the European Union won't “gang up” on America with China even if the trade bloc opposes the U.S. leader’s tariff measures. Jahier said, ahead of Monday’s annual China-EU summit in Beijing, he strongly opposes protectionism, but escalating the situation would not be the appropriate response, the South China Morning Post reported. Analysts say that China is probably barking up the wrong tree if it plans to seek a united trade front with European countries. Like the U.S., the European Union is firm in its fight against China’s unfair trade practice and intellectual property rights infringement, although it disagrees with Trump’s aggressive tariff measures, said Darson Chiu, a research fellow at the Taiwan Institute of Economic Research. The researcher added that there’s not much China can do to hit back but play the victim’s game internationally should the U.S. next escalate with an extra 10 percent tariffs on US$200 billion-worth of Chinese goods in two months. 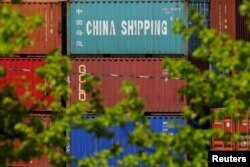 “China only imports $130 billion in American goods [annually], so, it is already out of elbows when it comes to the imposition of retaliatory tariffs,” Chiu said, adding that any talks in China about dumping U.S. treasuries it holds as a retaliatory move will only backfire and hurt its own economy. The ball is thus in the U.S. court, and only a poor performance in the U.S. midterm elections in November will force Trump to re-evaluate his trade strategies against China, Chiu added. FILE - Shipping containers are stacked at the Paul W. Conley Container Terminal in Boston, Massachusetts, May 9, 2018. The dispute, moreover, has escalated from trade volume to the broad economic interests of both countries, said Raymond Yeung, senior economist of Greater China at the Australia and New Zealand Banking Group. “The tension between the two countries is not simply on trade, but in anything that the Chinese government thinks happens to the U.S. economic interests” Yeung said. In other words, there is yet no end in sight to Trump’s trade war with China. In preparation for a protracted trade war, China continues to put the blame on the U.S. and play down the tariffs’ impact at home, while tightening media censorship. Chinese officials had nothing but angry words before any official efforts to seek rapprochement or renew negotiations with the U.S.
China’s Vice Minister of Commerce Wang Shouwen, representing Beijing during the country’s policy review at the World Trade Organization last week, called Washington a “trade bully,” which should “keep its gun” off China’s head. In a statement last week, China’s Ministry of Commerce argued that the U.S. practice would drag the global economy into the “cold war,” “recession trap” and “the trap of uncertainly to worsen global trade environment and industrial supply chains." Chinese censors have also stepped up efforts to control the narrative and public discussion about the trade dispute. Most media in China were reportedly told not to hype up the trade war or link it to stock market fluctuation, the Chinese yuan’s depreciation, or the country’s economic and financial vulnerability to avoid spreading panic. 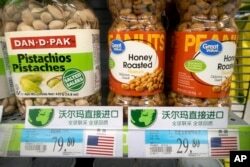 FILE - Imported nuts from the United States are displayed at a supermarket in Beijing, March 23, 2018. “Some are concerned that … China seems to have no tools with which to hit back. This is a huge misconception. The tariffs on $200 billion of Chinese goods are meant to be a bluff,” the editorial read. State censorship on social media appeared to have also reached its peak to silence unwanted comments since late last week. On Friday, the Sino-U.S. trade war was the second top-trending censored topic on freeweibo.com. The screening of critical voices continued this week with most online postings share the similar nationalistic nature.